Dave has been sailing on Lake Superior ever since he first arrived over 25 years ago to attend school at the University of Minnesota, Duluth. He started on Hobie Cats off the beach on Park Point and graduated to crewing racing sailboats with the Duluth Yacht Club. After earning his USCG captains license, he worked several summers in the Apostle Islands as captain of the Gavia for the St. Croix YMCA. He currently races on Sixx, a Farr 30. Dave is a middle school science teacher. He loves teaching folks how to sail and helping them explore the natural beauty of Lake Superior. Always fascinated by sailing, Larry has been cruising and racing here in the Duluth area for 38 years. His cruising experiences are primarily within the western end of Lake Superior including the Duluth-Superior Harbor, the Apostle Islands of northern Wisconsin, and all points in between. Larry has competed in the Trans Superior Race three times and participated in Bayfield Race-week for eighteen years. He hopes his many years on this amazing lake will make your time aboard safe and very special. 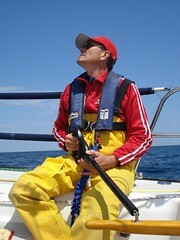 Jim Welinski is the founder of Moon Shadow Sailing and has been a sailing enthusiast for over 20 years. With his family he has spent many summers exploring the beautiful Apostle Islands aboard Moon Shadow. Jim has been involved in the marine industry for 10 years managing ShipShape Canvas, a successful boat canvas business located here in Duluth. Jim feels that sailing is the art of making a connection between your body, the wind, and the water.